A long-term goal of NU is to be accepted in the international community of universities. It actively pursues international contacts with overseas universities, government bodies, international agencies and non-governmental organizations for collaborative purposes, including students and faculties exchange, joint research and training programs, and other types of academic cooperation. 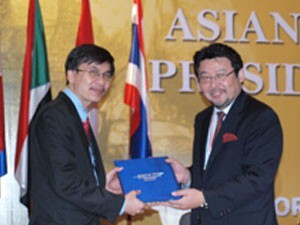 NU has signed MOUs with oversea universities like Bangkok University (Thailand), Ateneo de Zamboanga University (Philippines), Monash University (Australia), and University of Northumbria (England) and has cooperation with Auckland University of Technology (Newzeland), Malaya University (Malaysia) , AIM (Philippines) , Assumption University (Thailand), George Washington (USA), ECU (Australia), and the School of Economics of London University (England). The links with these foreign universities were formed to promote human resource develop­ment, exchange information and resources, joint projects, quality assurance, research, and students and staffs exchange. A vital part of Norton University's policy of internationalization is student exchange, and NU wel­comes international students from all backgrounds. Moreover, its teaching staff includes many members from a good number of countries, who's combined professional make a vital contribution to the vibrant international atmosphere in the university. The lecturers, most of whom have gone through higher education leading to Master's or Doctoral degrees, share their vast knowledge and techniques to their students and facilitate their learning to become future leaders or even pioneers in their own field. NU is also committed to contribute to the advancement of knowledge through research and scholarship which encourage its teaching and learning, and in this regard the faculty is encouraged to actively engage in research and publish their research outputs. Finally, in line with its goal to join the international community of universities, NU is commit­ted to becoming a repository of knowledge and expertise, a defender of academic freedom, and to assuming the role of critic and conscience of Cambodian society. Courses provided by NU are designed to provide students a broad knowledge in each field of study, operational, analytical, management and leadership skills, thus strengthen students' abilities to compete in the labor market and cope with the development of technology. The academic programs focus on both the local language and English. The first and second year students' classes are conducted bilingually while classes for the third and fourth year students are conducted in English. Aside from increasing students' self development and capability, this helps students who like to pursue their degrees abroad.